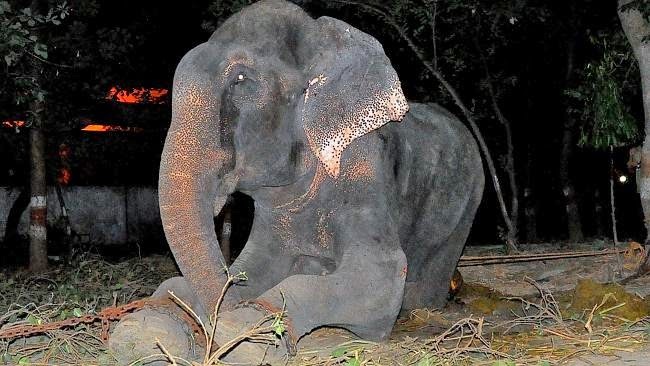 Raju, the elephant, that had been chained throughout his 50-year life and subjected to severe abuse all his life, was recently rescued from his captors in the Uttar Pradesh state of India. The elephant was used for begging, joy rides, and performing tricks to appease people for money. He had also been poked with spikes and had wounds in several parts of his body. He had even been fed paper and plastic! The elephant’s taste buds have been damaged and he cannot taste food anymore! Even his digestive system will take a long time to recover! They say he was probably taken from a forest as a calf and then sold several times to different owners! So much for the innocent soul to suffer!! The elephant was crying while being unchained! This elephant was seized by the Forest Department from his owner when he could not produce the documents for his possession. But what about those 50 long years that this majestic animal spent in severe abuse and torture? And why couldn’t he be rescued earlier? This incident arouses anger, disappointment and disbelief about the greed of humans who would go beyond any limit of cruelty to inflict abuse on innocent animals for monetary gains. What have we come to as a community? Are we still savages? This whole episode is unbelievable and almost ends my hope and faith in humanity.